The end of the year makes us all look back at statistics and moments of the previous twelve months. 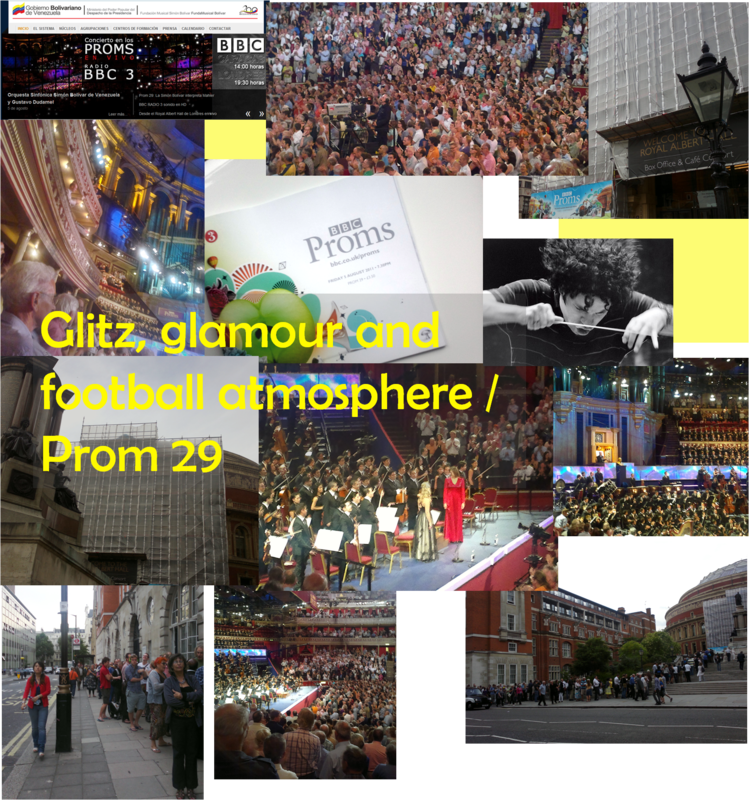 The rather unnecessary attack on prommers by Christopher Gillett…a blatant attempt at click baiting by Sinfini? A post on the rather blasé approach by maestro Gergiev on the goings on back in Russia. It seems the campaigning has had limited success as he still seems to be largely unwilling to make any definitive statements. We will be happy to see his departure from the LSO by the end of 2015. The post on a glorious dress rehearsal that blew my socks off. Sarah Connolly in blazing form taking on and conquering one of the gems of the French baroque repertoire. I was floored by the intensity and would count it among the most memorable performances of my opera going life to date. A gorgeous recital by two very accomplished young stars that was instantly charming and affecting. The rendition of Barber’s Hermit Songs was so fresh and beautifully realised it put a spring on my step. A mixed bag but shows how topical subjects tend to be read more. Tada! Fanfare and pomp and Roger Wright the director of the Proms (or rather officially Controller, R3 & Director BBC Proms) presented yesterday the new season of the Proms. Unfortunately the jubilation for the announcement is clouded by the booking fees that they will charge anyone prudent enough to book in advance. Surely if the well subsidised and much accused for being expensive and exclusive can afford not to charge a booking fee, the Proms and the Royal Albert Hall charge 2% of the transaction amount plus £1 per ticket up to a maximum of £10! This exorbitant fee makes the Royal Albert Hall a touch cheaper than the hideously priced Ticketmaster. For instance three tickets for The Phantom of the Opera would cost £159 with Proms pricing while the Ticketmaster price is a more robbing £163.50. 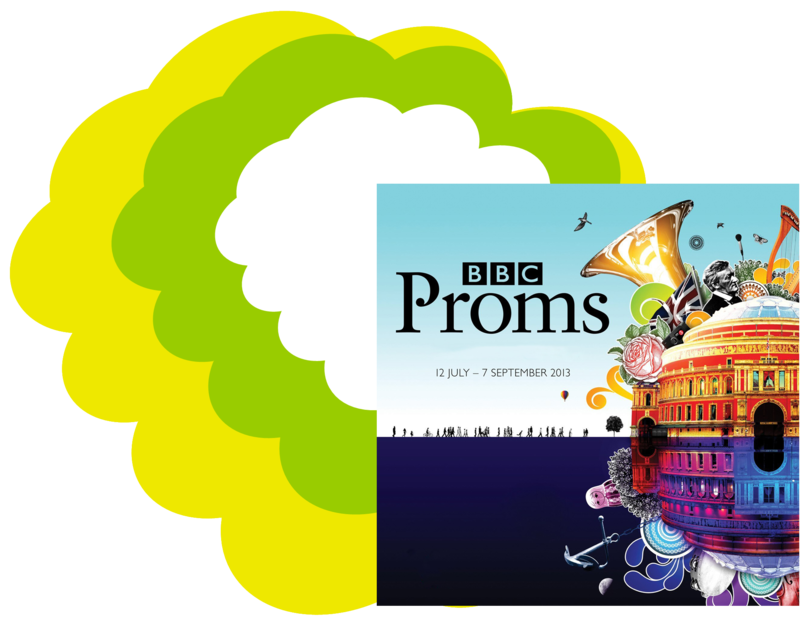 Of course the main difference between an Andrew Lloyd Webber musical and the Proms is one of them is subsidised by tax called euphemistically a licence fee…it seems the Proms are a licence for the Royal Albert Hall to make a killing on fees (as they do for the rest of the year). As one of the biggest block bookers of the Hall couldn’t they come up with a better arrangement on the booking fees? If most classical and opera venues can offer the same service for under £3 how dare they ask for £12? It is hugely disappointing to allow the host venue to capitalise at such a degree on the back of the Proms. Everyone would have been more understanding if the ticket prices had gone up a bit to cover the administration costs. To their credit the RAH responded with a couple of tweets, attributing their high fees to their lack of public subsidy. 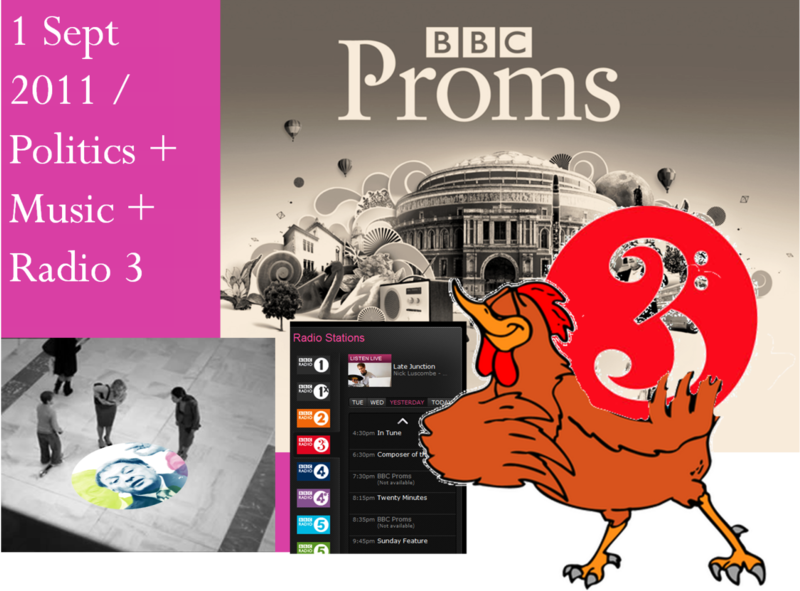 As for the Proms twitter folk they just think taking a pound off the standard booking fees of the RAH is enough. 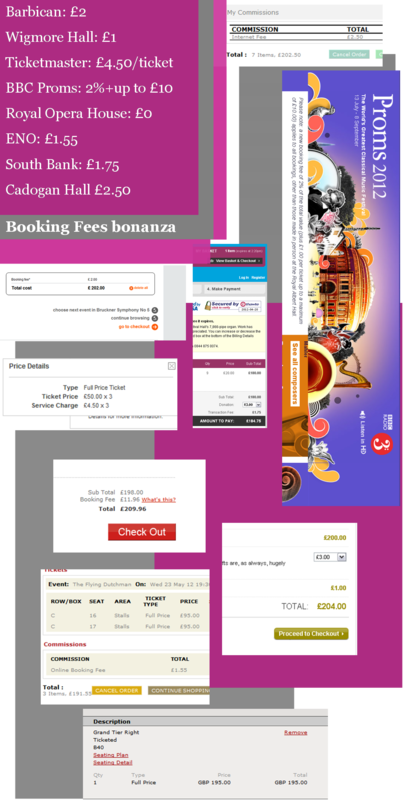 Dear readers what do you think, is it appropriate a public body like the BBC, using public tax money to put up this festival to gouge us with such fees? This evening I was aware that the Israel Philharmonic was performing at the Royal Albert Hall, but did not pass my mind that a disruptive demonstration would essentially cancel the live radio broadcast. While I was looking through my Twitter timeline I started seeing tweeps mentioning Radio 3 and tuned in, only to listen to a recording instead of the live concert. When they returned the presenter just made a passing mention to audience disruption. I do wonder if the editors/controller of Radio 3 are believing to be running a service from the 1950s in the mold of The Hour. The reaction of radio bosses was essentially to silence their staff on social media, the usual Proms cheerleaders fell oddly silent tonight. Very much like Radio 3’s deafening silence and unwillingness to rise up to the occasion and offer coverage live as the situation developed. The lack of bravery and nerve were truly shameful. Radio 3 just hid behind a recording and pretended that it would all go away. That is a damage limitation tactic that would only work in the 1950s. Today, and with the presence of an audience of over 5000 it’s a given that news will spread. So trying to have a hush hush reaction to it, as if responding to a damned inconvenience was a reflection of the vacuum that Radio 3 is operating in (it’s all about the music, silly, don’t rock the boat). As part of an organization that one of its main outputs is news, they really embarrassed themselves and lacked the reactive nerve that live broadcasting is supposed to call for. The Royal Albert Hall is a very difficult venue to secure, when you have 12 entrances. I had worked there for almost two years and know first hand the amounts of manpower required to make the building secure. For some high profile events we were used to even having marksmen/women on the roof! The news that four groups of protesters made it in the auditorium was not a huge surprise. But the reaction of the BBC, to just pull the live broadcast was not the reaction we would expect from our national, tax funded, broadcaster. I have always felt an affinity with the Palestinian cause but on the other hand find irrational bringing political protest into the artistic arena. Disrupting a concert is just a very childish way to make a very weak point that no one will take notice of. The arts are supposed to be one of the few unifying forces in this world, making it into a theatre of division and hatred is very sad. Zubin Mehta and the Israel Philharmonic deserved a warm reception despite of any grievances audience members had with the state of Israel. How would we feel if the London Symphony Orchestra were similarly attacked while on tour in response to the shoddy UK foreign policy? We would certainly think it was inappropriate and would seek to punish those individuals for disturbing the peace. Hope that some of those thoughtless protesters were indeed arrested on those grounds. In my view Radio 3 gave in easily to the pressure of a handful of protesters and essentially stopped this wonderful orchestra from having a huge live audience across the country. Hope the BBC will think again in similar situations in the future. PS It has to be noted that Radio 4 and BBC News have covered the incident soon after, but the stream from the Hall will not appear on the iPlayer. To see the Bolívars in action for the first time is to witness a new type of orchestra but also a different type of audience. The Royal Albert Hall was shearing with warmth from the audience and the intensity of the players. Surely miles away from the civil service ethos of the BBC Symphony Orchestra that provides the fillers between visiting orchestras to the Proms. In many ways the theatricality (and if you ask me, Mahler’s vulgar use of percussion) was a good fit for the fire that burns in the belly of this young orchestra and its elite line up. Possibly reading elite sounds strange in the context, but the members are selected through a national ongoing national programme in Venezuela that involves 250.000 members (FESNOJIV). Making the line up must be an arduous process but one that galvanises the young performers to grow and perform their way to international stardom. This was the one Prom that sold out in minutes as music lovers and frequent Prommers felt the need to be baptised in the holy musical water that seems to be the reputation of the Bolívars, indeed it seems that people queued outside for 22 hours in the hope to nab a close enough pitch to the front of the arena. As an ex employee of the RAH, two things we cannot underestimate is the love of the Prommers for music and the auditorium’s capacity to flatten it with its warehouse like resonant acoustic. Tonight the Prommers screamed out their love for the orchestra with the kind of intensity one would witness at a pop concert or a football match…think rapturous applause for Simon Rattle and multiply by ten. Now how was the Mahler, you’d ask. And if you have been reading this blog or following me on Twitter you will know my feelings of cool detachment and cold sweat that normally take me over. Symphony No2 has a lot of elements that I have disliked, the overblown over mannered throw in the sink writing is really not in my taste. And it is a hard old slog to live through 90 minutes of an exaggerated, intellectualised suffering and redemption Mahler-style. The kind of demonstrative look at me anguish and joy that I grew up to disregard as a central European trait that I had very little time for. I am afraid I have to say once more Mahler failed to move me on the whole, despite the admittedly sensitive vocal writing and intricacy of the orchestration. It just feels the kind of work that is there to display to everyone what a great composer you are but doesn’t know how to be economical within its own limits. The opening three movements were beaming with glistening string playing that brought out the drama and the artifice to the fore. Dudamel’s concentration and conducting from memory was impressively focused on communicating with the orchestra (including conducting a brass section up in the gods of the RAH’s Gallery through a video link). Unfortunately what really marred the experience was the hit and miss acoustic from H Stalls, that was at the same time reflective and very shallow, making the almost bucolic themes by woodwind and strings seem like happening next doors. And of course another annoyance is having the Loggia boxes behind the Stalls…which meant that a lovely lady behind me thought it was a good time to poor a large glass of wine during a very hushed passage…thank you madame, hope it was tasty! And then the fourth movement came about and here come Miah in a charcoal embroidered net curtain and Anna in one of the curtains from the boxes. A few minutes in an Arena Prommer received a text message, which I would think will be his/her eternal damnation by the closely knit microcosm of the season pass holders. Dudamel’s conducting did brng out the orchestras innate sense of rhythm at the more dance derived parts of the score ( a touch of a tarantella here, a touch of a waltz there) but somehow did not feel the connection between the individual parts as close as it could have been. The strife for speed and musicality maybe took over the need for a unified structure. And here I will declare my love for the performance of Anna Larsson, whose O Roschen rot! was enchanting and beautifully judged. I can imagine a lot of singers would really go on overdrive trying to make themselves audible, she used her sizeable instrument at a very low, barely audible level and brought us to a climax of full throated delivery over the enveloping strings. It was warm and absolutely gorgeous. The fifth movement brought us Miah’s singing which worked beautifully with the lovely phrasing of the choir but to me it seemed unexceptional. Even though she has a beautiful voice with strident colour, this time round it just didn’t transport us to the afterlife. But it was funny observing a young gentleman in the front row of the choir taking the crown from Gustavo as the biggest hair on stage, with his blonde explosion of curly hair! I feel very privileged to have had the chance to be there this evening, despite my general misgivings on Mahler’s emotional sincerity and his overblown aesthetic that doesn’t resonate with me. A huge thanks to Guy for allowing me to pop in and listen to this incredible experimental orchestra and its charismatic leader. A heady experience that brought together buttoned up 19th century Germany and Venezuelan fire in a Victorian community Hall with the acoustics of a retail shed by the M25. Do watch it tonight on BBC 2 (I’ll surely be recording it while being out and about in Devon) and do listen again on iPlayer and on repeat on Radio 3, Tuesday 9th at 14.00. Let me know what you thought!